Amazon's Kindle Fire might be a success, Samsung's Galaxy Tab devices might be attractive and available in nearly every screen size imaginable, but Apple's still crushing the global tablet market. A new report from iSuppli found that Apple's share of the entire tablet market was 69.6 percent during the second quarter, up 44.1 percent from the first quarter of this year. Apple shipped 17 million iPads in total, compared to Samsung's 2.25 million units shipped and Amazon's 1.02 million units shipped. Samsung's share of the tablet market was just 9.2 percent, up 2.8 percent from the first quarter of this year. Amazon's tablet share was just 4.2 percent, down 13.3 percent overall. ASUS and Barnes & Noble pulled up the rear with a 2.8 percent share and a 1.9 percent share of the global tablet market, respectively. It doesn't look like Apple's dominance will change anytime soon, either. "Apple is making all the right moves to rebuild its dominant position in the tablet space," Rhoda Alexander, director of tablet and monitor research for IHS said. "With the expected entrance of the 7-inch version of the iPad in September, Apple is sending a clear message that it plans to dominate this market over the long term. Apple's major media tablet rivals, Google Inc. and Microsoft Corp., hope to challenge Apple in the second half of the year, but will be facing formidable headwinds with no sign that the market leader is backing off of its aggressive strategy in the market." Apple's success is largely attributed to the iPad brand and its identity in the global tablet market, something that other device makers have struggled with. iSuppli also said that satisfied iPad owners return to the iPad for their next purchase, too. "Vendors must understand that customers are not buying hardware, but that they are buying an experience," Alexander said. "Users then want to carry that experience across multiple devices, creating an opening for the savvy vendor into a much larger sales opportunity than a single tablet." Two years after creating the market, Apple Inc. remains the king of all media tablets, with its global market share rising to nearly 70 percent in the second quarter, putting the company on pace to reclaim much of the dominance it surrendered in 2011. Apple during the second quarter shipped 17 million iPad 2 and new iPad media tablets, up a stunning 44.1 percent from 11.8 million the first quarter, according to the IHS iSuppli Display Materials & Systems Service at information and analytics provider IHS (NYSE: IHS). This industry-leading increase in shipments translated into a market share gain of 11.5 percentage points, as Apple's second-quarter global tablet share climbed to 69.6 percent, up from 58.1 percent in the first quarter, as presented in the table below. This marks a five-quarter high for Apple's media tablet market share. The last time Apple accounted for such a large portion of the media tablet was the first quarter of 2011, when it had a 70.0 percent share. "Apple is making all the right moves to rebuild its dominant position in the tablet space," said Rhoda Alexander, director, tablet and monitor research for IHS. "The company is pushing visual performance boundaries with the new iPad, while providing value customers with a lower-priced alternative, the iPad 2. With the expected entrance of the 7-inch version of the iPad in September, Apple is sending a clear message that it plans to dominate this market over the long term. Apple's major media tablet rivals, Google Inc. and Microsoft Corp., hope to challenge Apple in the second half of the year, but will be facing formidable headwinds with no sign that the market leader is backing off of its aggressive strategy in the market." New Entrants Add Spice"A major component of Apple's success to date is the company's well-developed ecosystem of content and applications it had in place before entering the tablet market, and its absolute control of the hardware, software and operating system," Alexander noted. "When a customer buys a media tablet, what he or she is really doing is purchasing a key to that ecosystem, not just a piece of hardware." Competitors have found it very difficult to duplicate Apple's approach. This, however, has left an obvious opening for 2012's newest market entrants: Google with the Nexus 7, and Microsoft with its Surface products. Both firms have invested heavily in ecosystem development of their own during the past several years. While this investment benefits the Android and Windows original equipment manufacturer (OEM) partners of both companies, it is not surprising to see Google and Microsoft, respectively, test the waters with media tablets of their own, especially given Apple's prolonged stranglehold on the fast-growing market. "It's possible that each of these vendors is entering the market intending to lead by example, rather than trying to be serious branded tablet competitors," Alexander said. "However, they both have the potential to end up as major players even if their original intent was only to demonstrate how it could be done. Microsoft in particular will be one to watch, with its existing Xbox gaming community on the consumer side and its operating-system dominance in business markets." IHS iSuppli media tablet consumer research shows that satisfied users are likely to go back to the same brand for their next purchase. In all likelihood, Apple already has developed a solid future customer base, which will continue to strengthen barring a major stumble on an upcoming product release. In contrast, Samsung, Apple's closest competitor, has shipped almost 13 million total media tablets. Samsung was one of the first to enter the market after Apple, introducing its first Galaxy Tab in the fourth quarter of 2010. However, Samsung hasn't yet achieved the cumulative unit sales that Apple reached by Christmas of 2010. One difficulty for players other than Apple has been in establishing a clear brand identity in the media tablet market. Without a distinctive brand identity, competitors are forced to battle on price, robbing them of the profit margin that fuels future product and ecosystem development. Google's entry-level $199 price point exacerbates the price pressure across the Android tablet universe, just as Amazon's entry did in the fourth quarter of 2012. It remains to be seen at what price point Microsoft will enter. 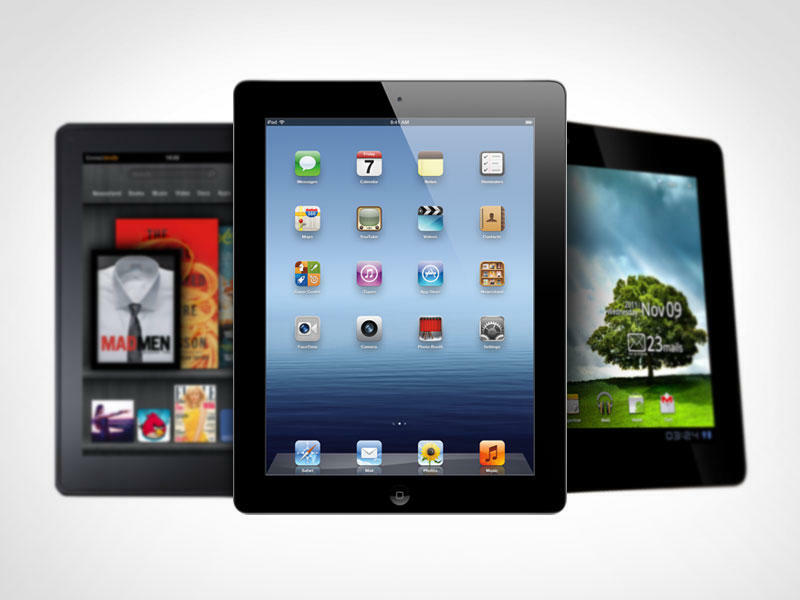 "Tablets are becoming an increasingly important piece of the consumer electronics space," Alexander noted. "Vendors must understand that customers are not buying hardware, but that they are buying an experience. Users then want to carry that experience across multiple devices, creating an opening for the savvy vendor into a much larger sales opportunity than a single tablet." Apple, Microsoft and Google are all keyed in to this much larger user experience. To date, the media tablet for the most part has been a consumer phenomenon, but the next big battle will be fought in the business space. Indeed, the ongoing rivalry is shaping up to be a battle of the Titans.